I like wood under my feet when I am up in a tree hunting deer. Come to think of it, I have always preferred wooden “stick-built” treestands over the more popular portable stands. Maybe this is all a function of age — for I grew up in an era when there was no such thing as a portable treestand. Besides age, another influencing factor was certainly the availability of property on which to build a stand. It isn’t legal to pound nails into trees on state forest or state game lands. I had a friend who actually built a successful treestand on state game land by tying everything together with rope. Not me. As a teenager, I was fortunate to be able to hunt deer with a bow on my grandmother’s 200 acres in Bedford County. Although I hunted from the ground on occasion, my favorite spots were in one of the three wooden treestands that I built over the years on her acreage. More recently, I have built stands on my own property. I built a new treestand this fall, which got me to thinking about the history and evolution of my treestands at this location. In the early 1980s, I invited my friend Larry to hunt deer on my property because he lost his previous hunting grounds to posting. We surveyed my property together, looking for a suitable treestand location. In the end, we selected a red maple tree that had a three-way split about 5 feet off the ground. The spot allowed the hunter to watch a good bit of a wooded funnel between two larger areas of forest. Larry brought out wood and nails and together we built a stand about 12 feet above the forest floor. Larry shot a small buck that year, but decided that we needed to build the stand higher for a better view. That next summer we added a “second floor” about 8 feet above the original platform. Larry shot four more bucks from that stand over the next five years before he retired and moved away from the area. The stand’s next occupant was my younger brother Paul, who hunted from it for two years. He wounded one buck during his stint and saw several others. I ended up shooting the wounded spike from my treestand a few hundred yards away. I hunted from the stand now and then, but at the time, my confidence rested with a treestand high in a double hemlock at the other end of my property. My father hunted in the triple-maple stand for two seasons, but at his age, he preferred the “first floor” accommodations, rather than the higher platform. By the turn of the century, my hemlock treestand had been knocked out by a storm and I had taken up residence in the red maple stand. Mother Nature had made a wise choice for me. I harvested a seven-point buck from the maple stand in 2001, and in 2002 — the first year of the new antler restrictions — I shot a beautiful eight-pointer with heavy antlers and a wide spread. Good things came to an end when, in 2003, a third of the red maple died and another tree fell over, demolishing the aging stand. This productive spot was too good to give up on. Early that fall, with a little help, I constructed a new and higher treestand between a cherry tree and two maples, just 10 yards away from the demolished stand. 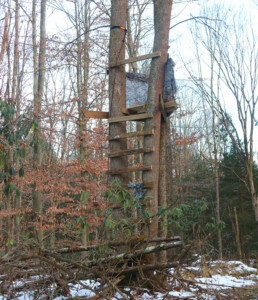 At over 20 feet in the air, the new treestand had a great view overlooking a rhododendron thicket and the natural funnel. However, it was dangerous to climb into — particularly when there was snow or ice on the rungs and platform. Nonetheless, I hunted from the nicer and higher but more dangerous platform from 2003 through 2017. Some treestands evolve into tree houses, with walls and a roof. Mine did not. I did have about 7 square feet of level floor, 2-inch-by-2-inch side rails to staple camo cloth to and rest my rifle on, a spot for my thermos, a hook to hang my carry-all bag, and a chair. That was luxury. The stand lived up to my expectations. I shot several more bucks from it, and during a couple seasons it produced two bucks – one for me and then one for my son-in-law John. On another year it was one for me and then a nice 8-pointer for my brother Frank. The smaller of the three trees died in 2015, and by 2017 some of the nails and screws were not holding well in that tree. Then one of the large stand-supporting spikes broke. I made a temporary repair and hunted there in 2017, passing on a legal buck. Nature was again dictating a change. I am 68 years old, but not ready to give up hunting from a tree. I built my new treestand between three cucumber trees. It is about 12 feet in the air, easier to get into and much safer. I am less than 20 yards away from the previous stand — and able to watch the same general area. I would like to end this with a report of a big buck that I shot the other day, but that story has yet to be written. I hunted through two bad-weather days and one good one. Wildlife seen thus far: three does, a pileated woodpecker, a red fox and many red and gray squirrels. I have faith that the new treestand will be as productive as its predecessors. It is just a matter of time.